Forgotten Tales of New York — Few New Yorkers remember the night when firemen, in tuxedos and top hats, were dragged from a ball to extinguish a Waterloo blaze, or the typographical error that reported Theodore Roosevelt taking a “bath” instead of his presidential “oath.” Still fewer remember Cephas Bennett, a missionary from Utica and printer of the first Burmese Bible, or H.L. Mencken’s humorous article on the history of the bathtub, still quoted today as factual although entirely invented. Seasoned storyteller Melanie Zimmer seamlessly weaves together these hard-to-believe, yet entirely true, tales. From the monster of Seneca Lake to the man who inspired the American icon Uncle Sam, discover the lost secrets of the Empire State. These stories and many more are included in Forgotten Tales of New York. This book contains one hundred sixty pages of important and also little known tales from New York State and includes fifty photographs. It’s yours for $14.99. This book is in limited supply. Buy yours now! 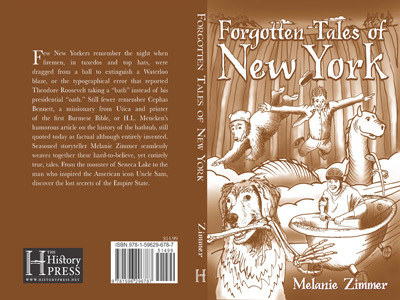 Please contact Melanie Zimmer regarding book signings or readings for Forgotten Tales of New York.